Some time after the second movie, the Autobots are now assisting the US government in ending human conflicts and Sam Witwicky (Shia LaBeouf) is jobless living with his new girlfriend Carly Spencer (Rosie Huntington-Whiteley). During one of their missions, the Autobots discover that the humans had previously encountered Cybertronian technology before...during the Apollo 11 lunar landing of 1969. They realize that what they have is part of a ship that contained a technology that would have helped them defeat the Decepticons during the Cybertron war - something that the Autobots thought have been lost forever. They race to retrieve technology and its inventor and keeper, Sentinel Prime, the former leader of the Autobots before the Decepticons can. Meanwhile, Sam is still craving adventure with the Autobots and is unhappily working as a mailroom boy when he uncovers a Decepticon plot to take over the Earth that involves the technology the Autobots now have. Now they will have to again work together to save the Earth from the Decepticons...before its too late. Let me start by saying that this is a pure action movie and should not be watched for its storyline. The visual effects are amazing but I was disappointed by the 3D effects once again. The movie was full of action sequences that came one after another in an never ending glorious wave of chaos and destruction. Lots of fight sequences between the sentient machines will please anyone looking for action. The last hour of the movie was entirely made up of fights and explosions. If you like an intelligent storyline then Transformers 3 is not the movie to see. It seemed that the story was just an after thought to the action scenes. It felt like this whole movie was just an excuse to show off some awesome fights, action and special effects. The motives of the characters didn't make sense and dialogue left a lot to be desired. As for the characters, Sam Witwicky seems to have gotten more annoying. He seems to think he deserves to be continually treated as special and has developed an attitude to those that follow rules and regulation. He doesn't seem to be a hero at all. And Rosie Huntington-Whiteley's character was just put in for eye candy. One scene even has her just standing still not even blinking or wincing while large things crashed and exploded around her in slow motion. Optimus Prime seemed to become more cruel as well. Overall, A+ on the visual effects but C on the story. But I'm sure a lot of people are just going to watch for the action, so if you are one of them, this is the movie to see. 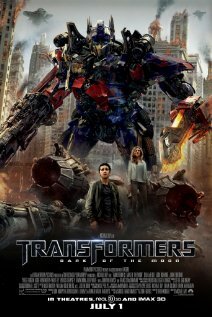 Transformers: Dark of the Moon is now playing in theatres everywhere. Spent lots of time in Vancouver's Stanley Park over the years. Love it.